Club Tours Agentur, The Czech Republic’s finest organizer of choral tour programs, is pleased to announce the creation of MUSICA SEMPER VIVA, a new and exciting tour opportunity for singers. 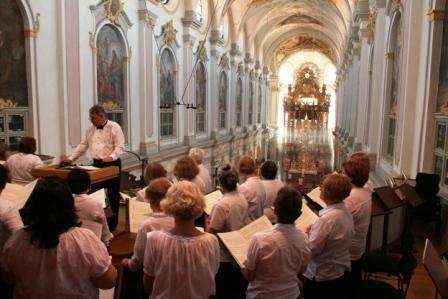 CTA has for many years organized excursions for travelling choral and instrumental ensembles in Central Europe. It is also the organizer of many prestigious music festivals. The Agency sponsored a very successful program, SING TO THE LORD, which provided an opportunity for singers from Canada to form a choir in Prague, engage in an intensive daily rehearsal schedule, and then travel to outlying communities to sing. Past tours have given performances in Budapest, Salzburg, Vienna, Munich, Berlin, Leipzig, Prague, and a number of smaller communities in the Czech Republic. A joint venture between Club Tours and Canadian Choral Director, Peter Dent, this program terminated at the conclusion of the 2014 Sing to the Lord Tour. Club Tours President, Michal Svarc, is of the opinion that there is still a market for a program which recruits singers from various communities and creates a positive atmosphere for them to come together, make music, and have a focused holiday. As the sponsoring agency, he has engaged Peter Dent to continue as the music director.